At Caliber Collision, we’re committed to going the extra mile and always looking for new ways to steer people’s lives in the right direction. That’s why we started our Recycled Rides program: an initiative designed to give deserving drivers newly refurbished vehicles, and hopefully, a newly refurbished outlook on what’s to come. And we’re proud to say this month’s Recycled Rides events did precisely that. Now, of the 40 giftings planned for 2016, two in particular really stood out from the pack. In honor of Arson Awareness Week, May 1-7, we teamed up with the State Farm Arson Dog Program. The Arson Dog Program strives to sniff out arson fraud and increase community awareness through the help of accelerant detection canines. An honorable mission we’re proud to walk beside. 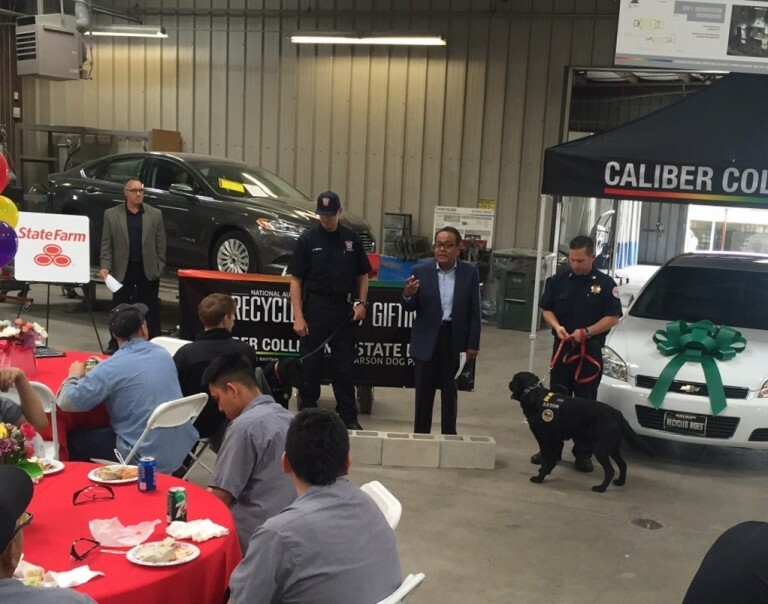 So, with the help of our partners, we found two vehicles and two very deserving Arson Dog recipients. New Bern Fire Marshal Danny Hill and his K-9 partner Darby. Danny and Darby are first responders, who man the frontlines of arson prevention. Our Raleigh center teamed up with State Farm to honor Danny and Darby by presenting them with their newly refurbished Ford F150. 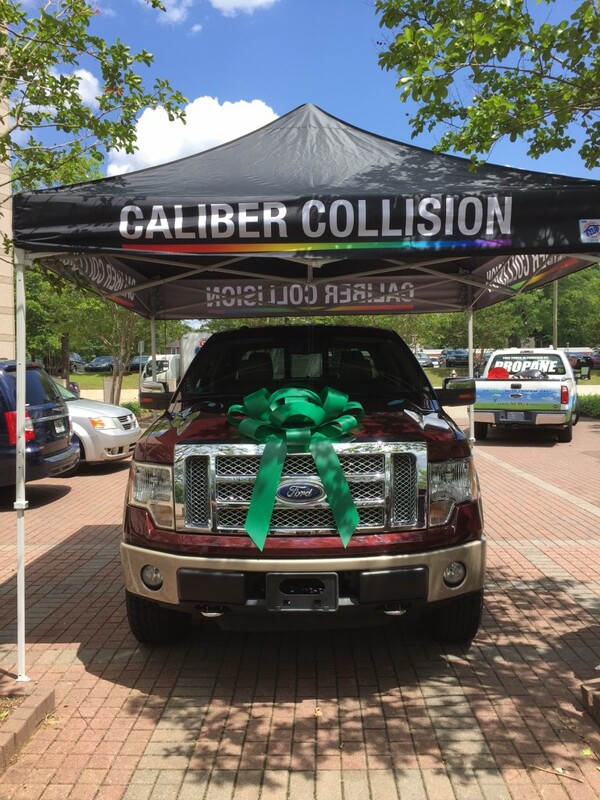 The truck was donated by State Farm, and repaired by Caliber teammates, who volunteer their time outside of business hours. Many were in attendance, but most notably was the State Fire Marshal Wayne Goodwin. Goodwin spoke to the crowd, addressing the importance of arson awareness and efforts locals can take to help fight fires with purpose. First responder Jeff Schwing and his K-9 partner Remington. Schwing and Remington are part of the Eastern Sierra Task Force, which is comprised of a small group of highly trained investigators. Again, with the help of State Farm, we were able to restore a Chevrolet Impala and present it to this deserving duo. In addition, State Farm was kind enough to grant $9,850 to the Fire Investigative Strike Team of Fresno in order to help purchase a vehicle for Fire Investigator Lee Wilding and his K-9 partner Tessa. As always, our goal at Caliber is to not only restore, but to protect the rhythm of people’s lives: whether via car, home or land. According to the National Interagency Fire Center, of the 10 million acres of wildfire nationwide last year, people caused 86%. And with limited resources, most fire departments don’t have a go-to vehicle for the Arson Dog teams. So, we’re thankful we had the opportunity and resources to lend these heroes a helping hand. Thank you to all who came out to support Recycled Rides and those involved. And if we missed you this time, don’t worry; there will be more opportunities. We hope to see you there, because together, there truly is a lot of hope for the road ahead.